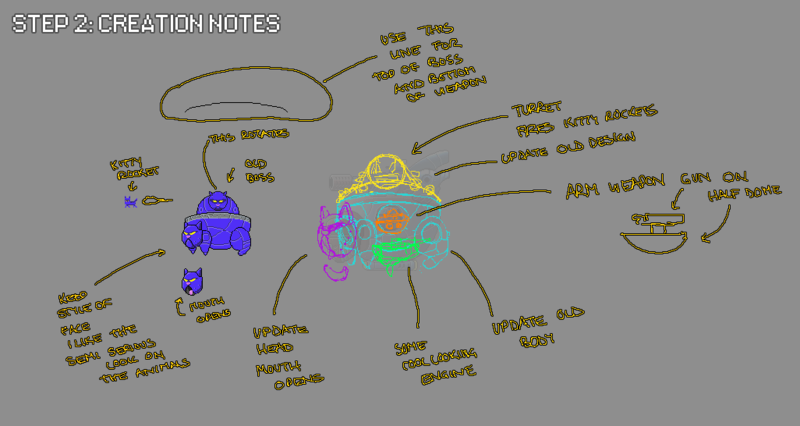 In our upcoming game Boss 101 you can roll bosses, sure, but let’s talk about HOW they get in the game. 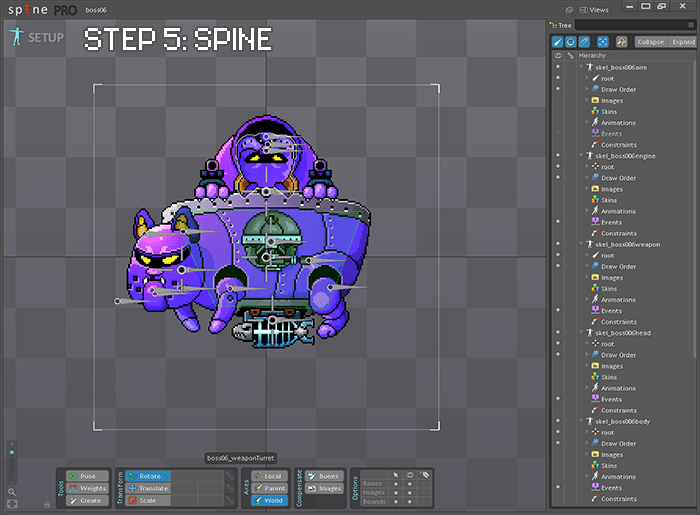 A couple notes – we use GameMaker Studio (from YoYo games) and Spine (from Esoteric Software). Spine works with Unity and a few other engines I believe, so this applies even if you are not using GameMaker. Basic Setup: Organization – we organize the bosses into separate files. The layout of the files is exactly the same so when they load into the game they all can be interlocked with each other cleanly. Let me assure you organization is a giant step in ANY process – so sort your shiz out FIRST then start working. Don’t be afraid to constantly ask yourself “Is this the best way?” either! Step 2: Make any notes relevant to the boss as we draw the parts. In the case of the kitty boss we already had a reference to work off. We wanted to upgrade the look so we pointed out ideas and design decisions to follow when doing the art. Step 3: Black and White version! Generally speaking for MOST of the art we do a black and white version THEN we color it. Seriously folks – it makes your life a lot easier to concentrate on contrast and silhouettes FIRST then color it in as you like. If you are John Singer Sargent you can disregard this advice. Step 4: Color it up. We work on Photoshop generally, but you can achieve the basic coloring we do in nearly anything you choose. The advantage of doing black and white is we can color block in areas quickly in a SEPARATE LAYER over the black and white art, apply a layer effect (like “Color”) and then experiment with colors and shading until things work. You see how we are!?! Efficiency folks – that’s how to do it! Step 5: Bring all the pieces into Spine. We load each section (head, body, weapons, etc.) into Spine as an individual skeleton and then arrange them in space accordingly. From there we add firing, pre-firing and idle animations. A Note on Spine – if you are serious about getting animation done I would recommend Spine. The low cost version of it would be perfectly suitable for most all indie needs and the TIME saving would be tremendous. Doing all this by code or hand would have tanked Boss 101 at the starting line. Those are the basics and next time we can delve into animations practices or perhaps something you are curious about! I’ll check here for feedback.